If you haven’t made French Toast in awhile, what is holding you back? I forget how easy it is to make this delicious breakfast until I make it and then I wonder why I don’t make it more often! 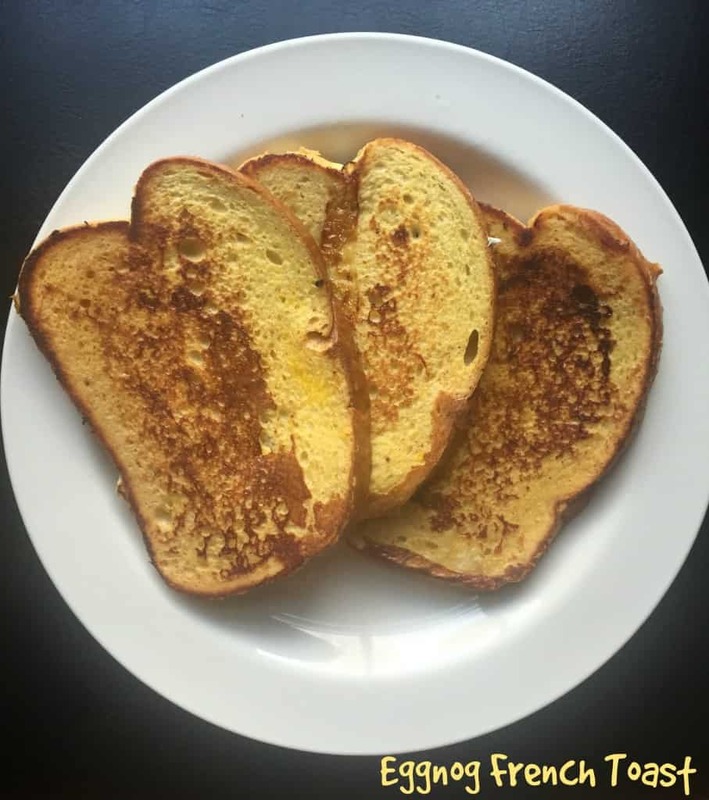 To get our French Toast in the holiday spirit, I have been making Eggnog French Toast! Delicious. To be honest, making Eggnog French Toast wasn’t really driven by my desire to make our French Toast more festive, it was driven by the fact that we ran out of milk. But now that I’ve made French Toast with eggnog, I am hooked for the remainder of this season. French toast ratio: 1/4 cup eggnog (or milk) for every egg. 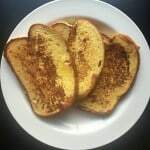 French toast is really such an easy breakfast that can be made on a school day or for a fancy Sunday breakfast. You only need four ingredients – eggnog (or milk! ), egg, vanilla, and cinnamon. That’s it. To scale this recipe up, remember the ratio of 1/4 milk (or eggnog) for every egg. 1/4 cup milk and one egg usually makes about 4 slices of eggnog french toast depending on how big your bread slices are. I like to cook my french toast in butter to give it a nice buttery flavor and then drizzle a little bit of maple syrup over the top and serve it with fresh fruit. Easy peasy. Filling and yet mildly decadent. 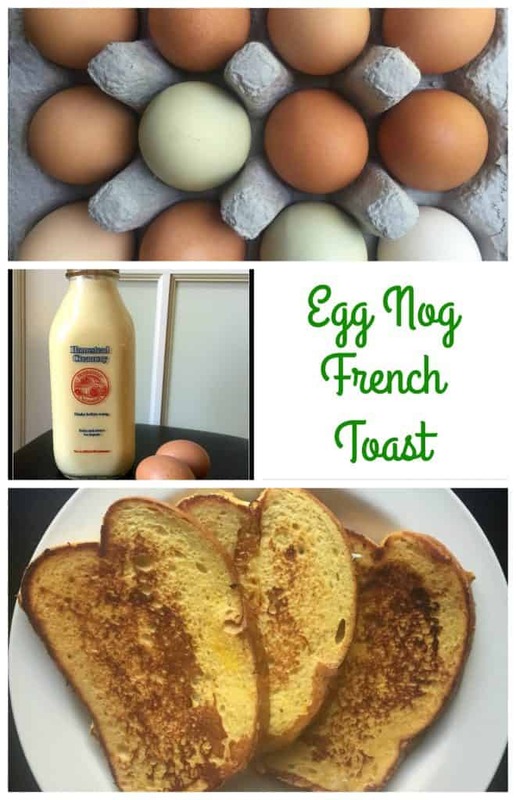 To make your holiday breakfasts a little more festive, make this eggnog french toast! Whisk together eggnog, egg, vanilla, and cinnamon. Melt butter on a hot pan. Dredge bread, one piece at a time, in your eggnog mixture. Make sure both sides are well coated. Cook bread over medium high heat for about 4 to 5 minutes until the bread is lightly browned and is easily flipped over. Cook second side for 2 to 4 more minutes. Serve with maple syrup, powdered sugar, and fresh fruit! Enjoy! I find it hilarious this came out of running out of milk–brava! And yum, it sounds like a genius idea to me! Thanks, Laura! Sometimes it’s funny how it all works out. We are so hooked on our decadent French Toast version now! 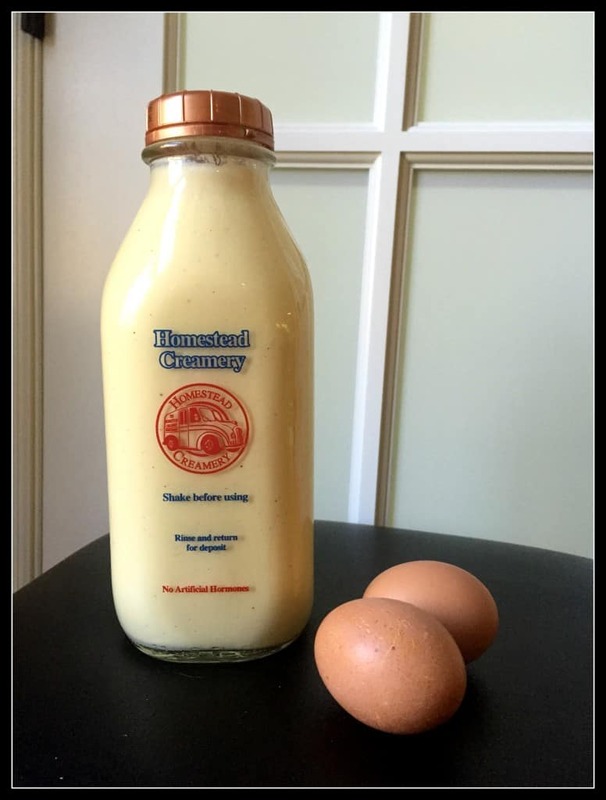 such a great substitute – Eggnog is perfect for French toast custard! It really worked out well! It was a good problem to have! I am so craving French Toast! As soon as the weather got cool, I want french toast all the time! This looks delicious, it would make a wonderful Christmas morning breakfast! Thanks, Marye! That is the plan! Thanks, Susan! It really is a great holiday breakfast – but super simple so no extra stress!